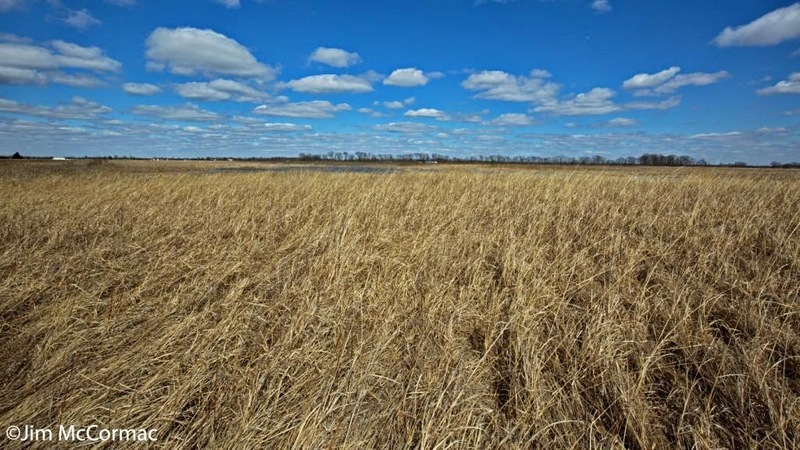 A gorgeous blue spring sky illuminates acres of prairie grasses buffering highly productive prairie pothole wetlands at Battelle Darby Metro Park in central Ohio. I was fortunate to spend time with lots of ducks over the weekend, and some briefly captioned pictorial highlights follow. For an enthusiast of fowl, such as myself, it doesn't get much better than this. 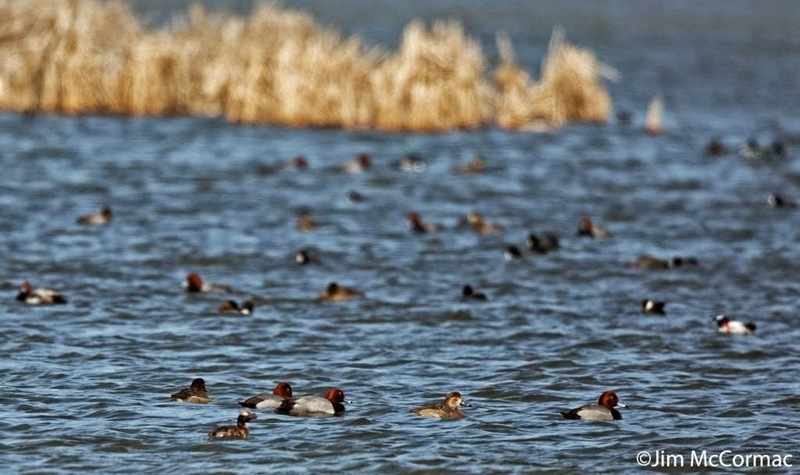 A shallow marsh at Big Island Wildlife Area in Marion County teems with waterbirds of many species: Redhead, Ring-necked Duck, American Coot, Horned Grebe, Bufflehead and others. 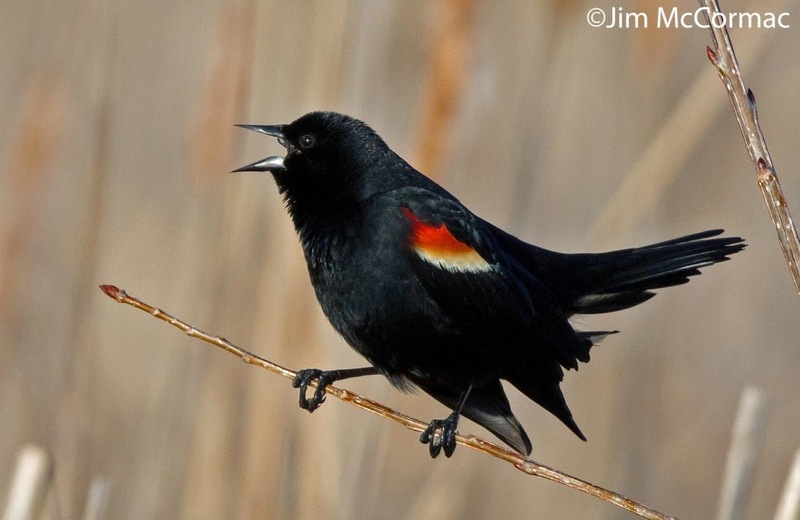 The Red-winged Blackbirds have recolonized Ohio, and chaps such as this were making themselves known from every other shrub, it seemed. 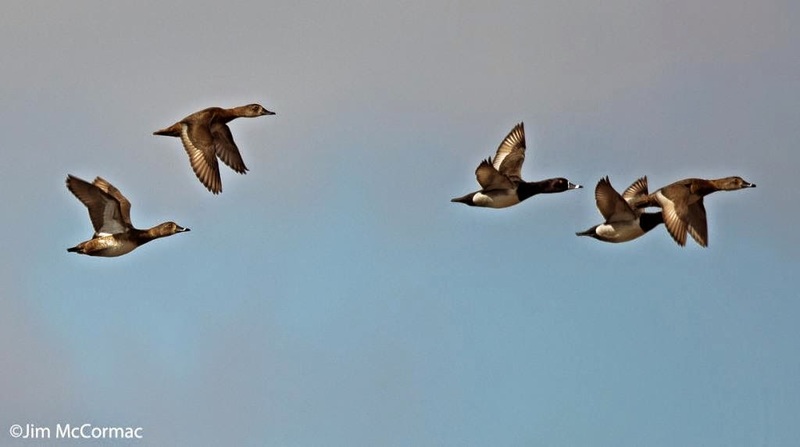 A line of Ring-necked Ducks rockets by: two drakes, accompanied by three hens. 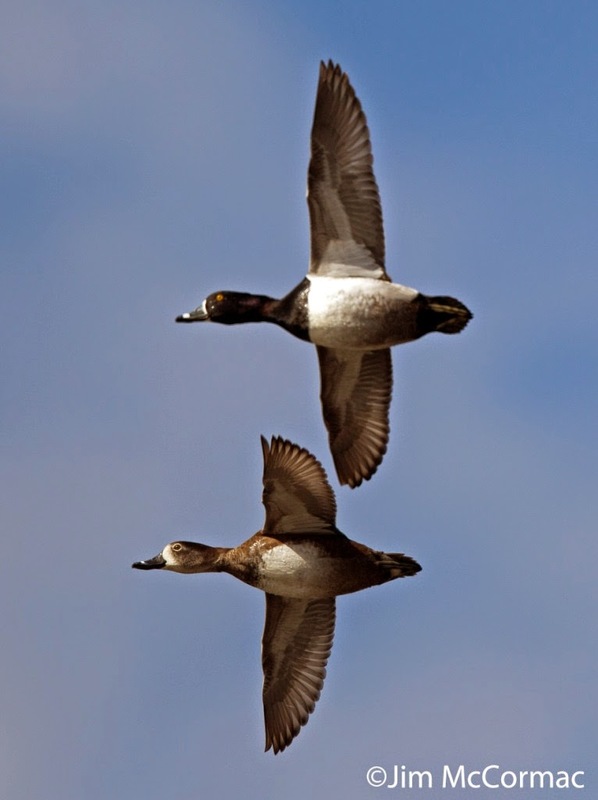 A closer view of a pair of Ring-necked Ducks, female below, male above. The focus is on the hen. Few birds beat the Northern Pintail for sleek elegance. This quintet sports a trio of drakes and a pair of hens. 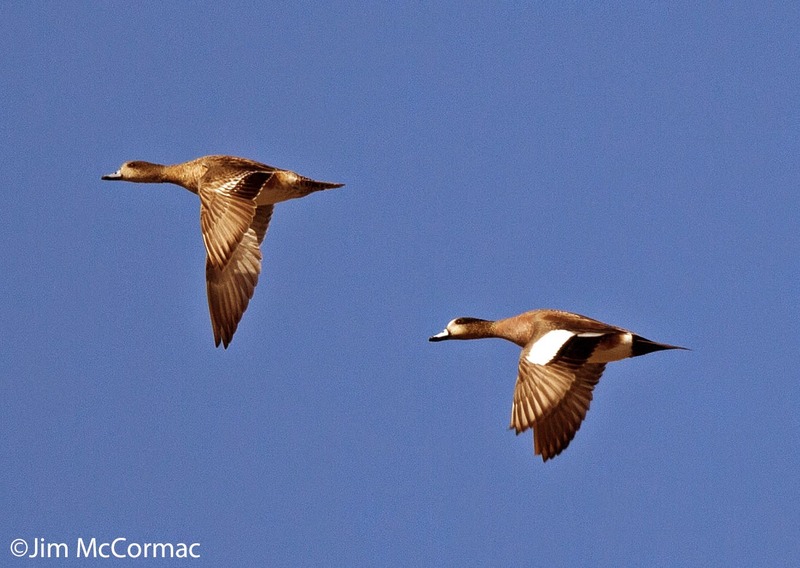 A female American Wigeon leads a male. His huge white wing patches stand out even from great distances. 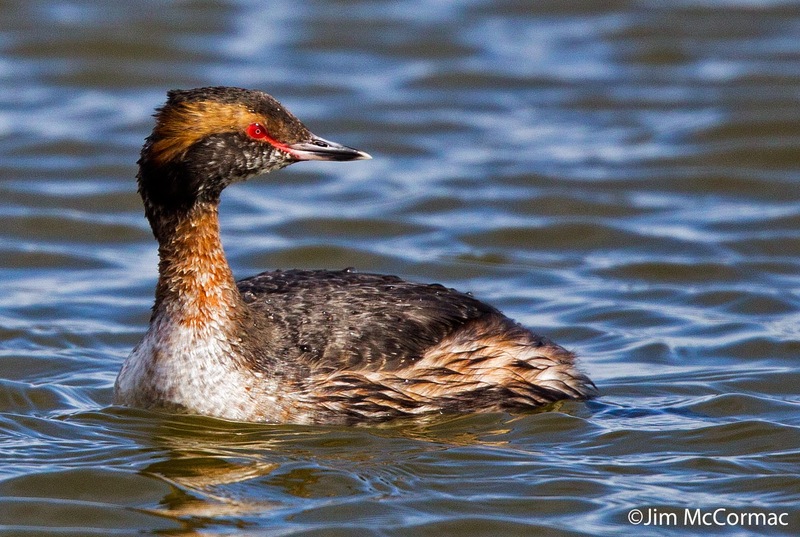 Plenty of Horned Grebes are also passing through, and many are in transition between basic (winter) and alternate (breeding) plumages, such as this bird. He'll look even snazzier in short order. 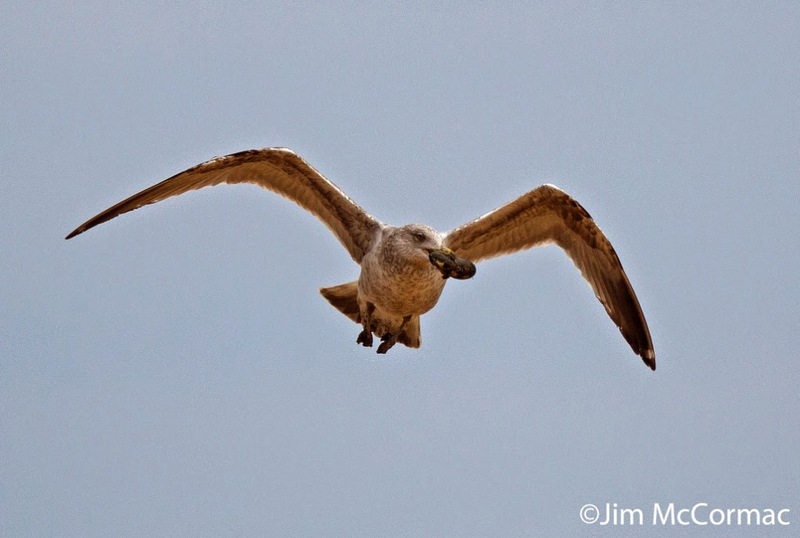 Herring Gulls are ubiquitous fixtures along the New Jersey coast, and on my recent trip to Barnegat Light and vicinity I fired off many shots of the handsome birds. 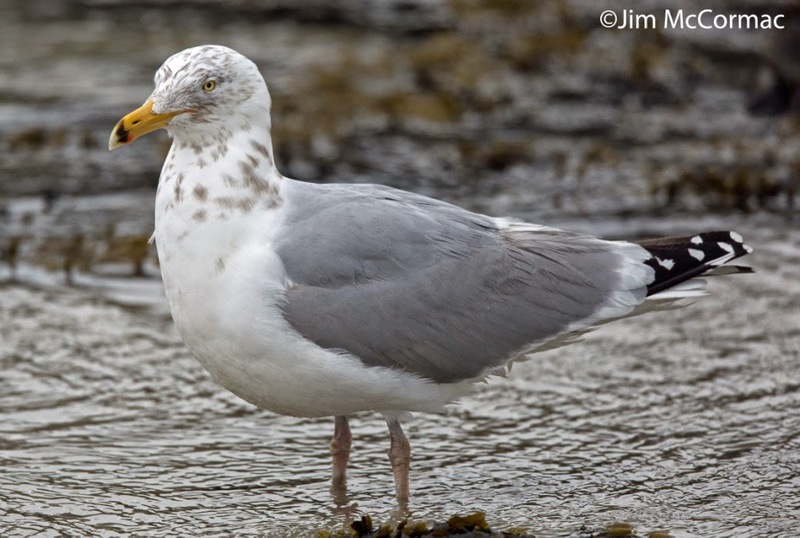 It isn't hard - the gulls often sit at near arm's length, and regard us humanoids with steely yellow gazes. 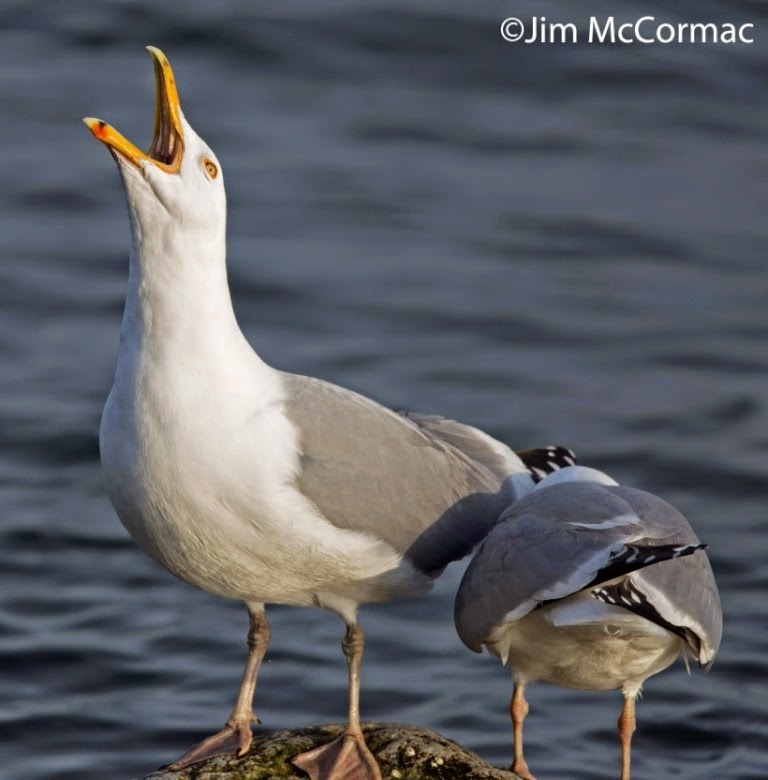 The bird above is an adult Herring Gull, still in its winter plumage. 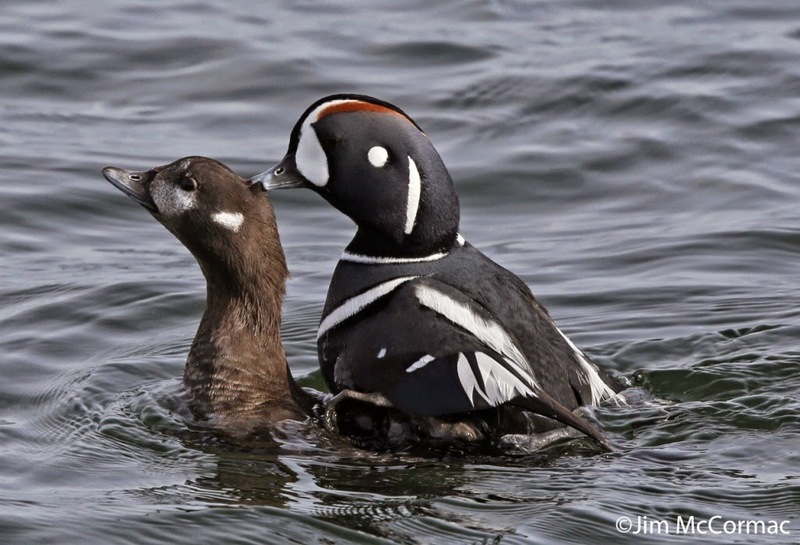 They don't shift feathers much between summer and winter, but nonbreeders become dingy about the head and neck, and the colors of the bill and orbital ring around the eye become less pronounced. Here's a bird that has transformed into breeding finery, and is loudly braying about it. Its mate is also bugling away, just facing away from the camera. Quite a racket these two made, but their loud yelping bugles are a classic sound of the sea coast, and would be greatly missed were such sounds absent. Note how this bird - male, I believe - now has clean white feathers on the head and neck, and its bill is brilliant yellow with bright red and bold black spots. Click the pic to enlarge, and you should be able to see the orangish-red orbital ring encircling the eye. Just about everywhere one goes, there are smashed mussels. This is a hard-packed sandy road through the Edwin B. Forsythe National Wildlife Refuge, which lies in the shadows of Atlantic City. 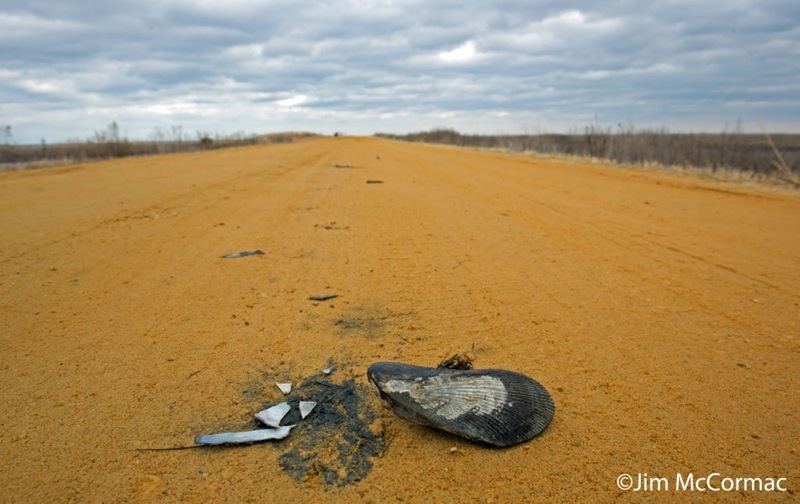 It isn't vehicle traffic that is smashing these clams, whose shattered husks littered the refuge roadways. After all, mussels don't walk too well and would be unlikely to make their way from the water and up on the dikes. I placed an intact mussel by one of its vanquished mates for this shot. I don't know what species this is, but perhaps some reader will and can tip us to the ID. This is what is smashing all of the mussels to oblivion - Herring Gulls! The clever feathered beasts are quite adept at ferreting mussels out from the shallows, seizing them, and flying skyward. What a fate for the hapless clam. These rocklike animals mind their own business, usefully filtering particulate matter from the water. Alas, a good many are fated to be pulled unceremoniously from the drink, and in the blink of an eye given an unwanted flight high overhead. Bombs away! A clam in freefall, a fraction of a second after being released high over the aforementioned sandy lane. 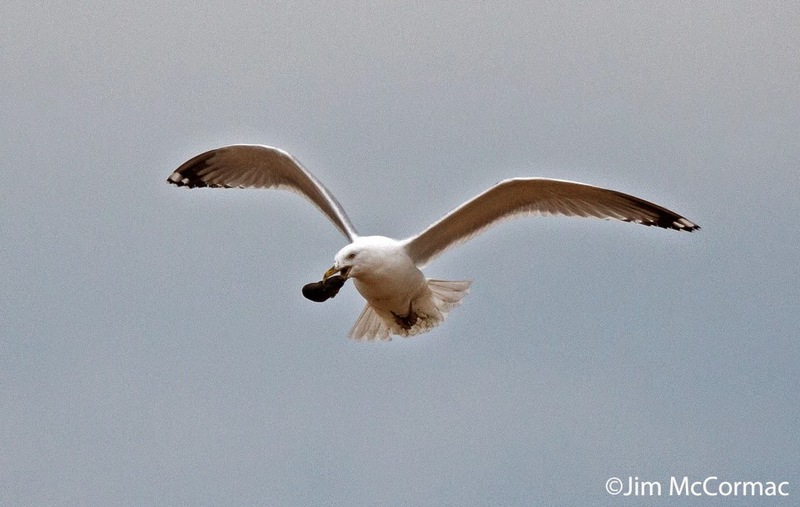 The gull plunges rapidly to earth on the heels of the mussel, to see if its trick cracked open the hard-shelled critter, and to ward off other gulls who would swiftly materialize to pirate the prize. 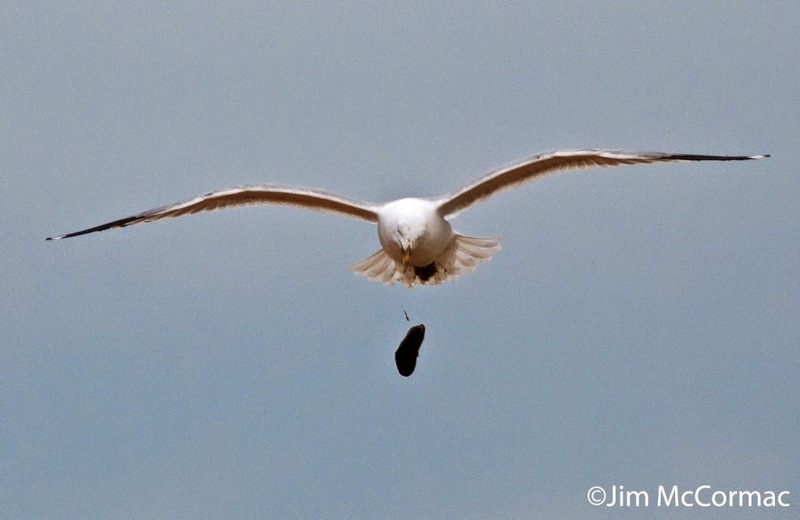 Oftentimes, the first (or 2nd or 3rd) attempt fails, in which case the gull grabs the prey and quickly swoops aloft to try again. 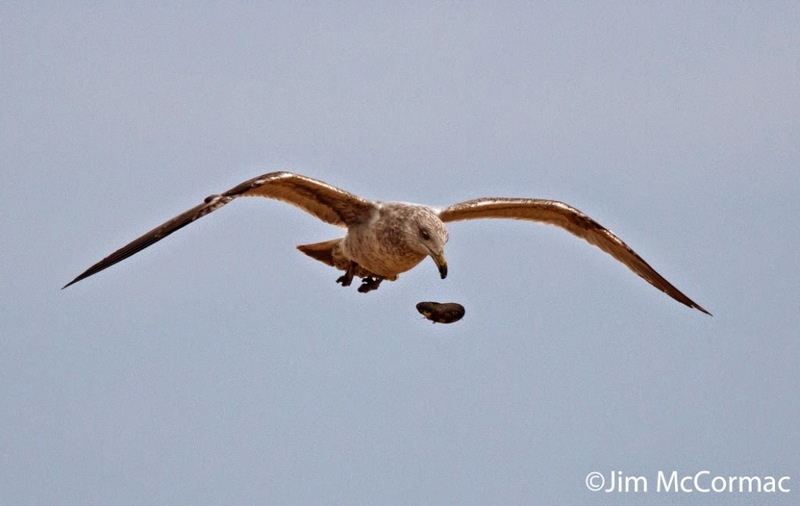 Even the young gulls quickly master the art of clam-smashing. This is a young Herring Gull and it is every bit as adept at the art of mussel fishing and the subsequent clam-cracking as are the adults. While this may seem like a lot of work, the reward makes the toils well worthwhile. The gooey, slimy body that is normally well protected within the hard shell is rich in fat and protein. 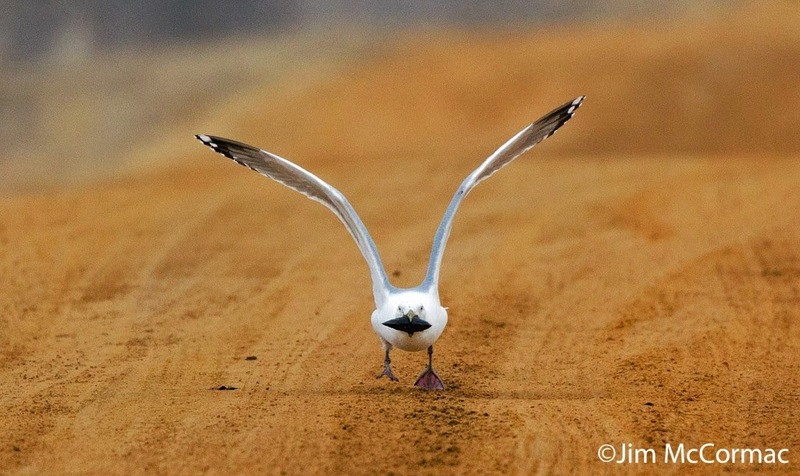 This clever behavior is just one of numerous examples of the wiliness and street smarts of gulls. The large species in the genus Larus, at least, are opportunistic survivors who will no doubt be plying their trade long after we are no longer around the marvel at their intelligence. Yesterday marked the 14th rendition of the annual Shreve Migration Sensation. I was flattered to be asked back to speak; this go-round my topic was the wetlands of Wayne County. The SMS takes place in the village of Shreve, population about 1,500. During SMS, that number swells to about 3,000. It's a big event, and great for the local economy. Thanks to everyone who organizes the Sensation, and puts in the hard work to make it happen. As you may have learned, predicting weather and atmospheric phenomena is hardly an exact science. Knowing that I'd be in Wayne County until late in the day, I kept an eye on various forecasts, which were calling for a clear, cloud-free Saturday evening. That was good news, as I could turn my camera to the stars once again. Didn't happen, at least initially - clouds rolled in and blanked out the evening's stars. After shooting waterfowl (with camera) in one of the marshes until dusk settled thoroughly in, I headed for home. About half an hour into the trip, the cloud cover was swept aside and the night sky glittered with stars. I turned around, and headed quickly back to one of the most remote, darkest corners of the massive Killbuck Marsh that I knew. By the time I got there, rigged the camera, donned boots, and waded back to a good spot, it was thoroughly dark. To my south, the sky seemed plenty dark, but for star shooting one generally wants to point the camera north, towards the North Star, or Polaris. This celestial body is in line with the axis of Earth, and does not appear to rotate and thus provides an excellent reference for dramatic long exposure night shots. What I did not anticipate was the high degree of light pollution, even in this seemingly remote spot. 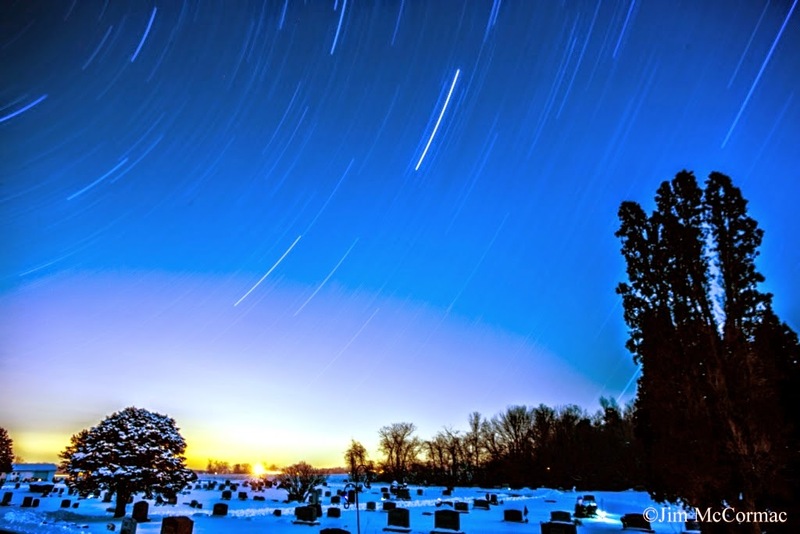 Even though it is about eight miles to the north, the city of Wooster put up such a glare of night light such as to ruin any astrophotography opportunities. For this shot, the camera was set to take continuous 30-second exposures, and 84 of those are stitched together to make the image. As the camera labored away, and I kicked around the darkened marsh, I realized that the light was probably going to kill the shot. And it did. Very few stars are visible, and the light makes it appear is if the sun is rising. There wasn't much I could to do to mitigate for the light by adjusting camera settings, or in post-processing. I figured I'd let the shot play out, though, as even if bad it would be a learning experience. After the 45 minute exposure was complete, I packed everything up and headed for another, darker spot that was (sort of) on the way home. Ah! Much better! 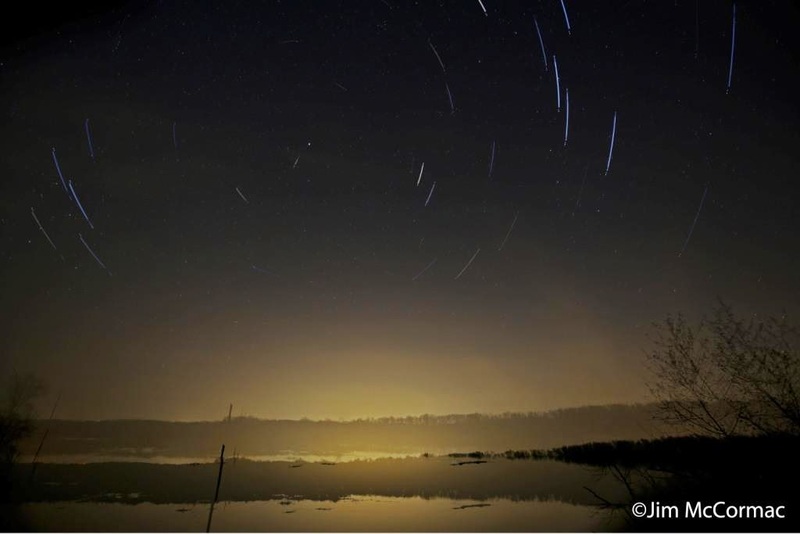 This hour-long series of 108 30-second exposures was made from a remote spot near Mohican State Forest in Ashland County. Even though it is far darker than the previous locale, plenty of light still bleeds through courtesy of the distant cities of Loudonville, and probably Ashland. However, the distant glow creates an interesting backdrop that I don't altogether mind. While this image is a composite of 108 shots stitched together with editing software, I have done very little else post-processing other than to slightly lighten the image to allow the trees in the foreground to show better. The dotted line going through the shot is from an airplane passing through; yet another form of nighttime clutter that the astrophotographer must deal with. Other than finding a dark corner of the world, the most challenging aspect of making star trail images is setting up the shot. I have learned that in light-plagued Ohio, using a single very long (half hour to an hour) exposure will not work. Such a lengthy exposure lets in far too much light. Short 30-second bursts is the way to go, and to do that one must mount the camera on a sturdy tripod and activate the shutter with an inexpensive remote cable release. It must have a locking mechanism, so that when the button is depressed and locked, the camera will keep firing shots every 30 seconds until told to quit, or the battery runs out. The lens choice is important. I used Canon's fabulous new 16-35mm f/4 ultrawide angle to make these images. It was set at its widest, 16mm, and focused to infinity. Camera settings are fairly straightforward and the following seems to work pretty well in general. Aperture should be wide open, which as noted is f/4 with this lens. Shutter speed is set to 30 seconds, which is the longest my (most, probably) camera will go without resorting to the "bulb" setting. ISO is critical, and the setting that will require the most onsite tweaking. An ISO between 500 and 800 will probably suit many conditions, and for the image above I settled on ISO 500. It's always best to take several practice shots and assess the quality of star shine on the camera's view finder to dial in ISO. Probably the trickiest part of setting up a star shot is composing the image. It goes without saying that you're working in very dark conditions, and that makes it tough to accurately assess one's surroundings. I like placing Polaris in or near the left top corner of the image, as the stars appear to rotate around that fixed point. Polaris is clearly visible in this image, framed (almost) perfectly through a gap in some foreground trees. That's one of the major tricks - getting Polaris exactly where you want it in the shot. Looking through the camera's viewfinder and finding an individual star is not easy; in fact it can be impossible to tell which is which. A hugely helpful aid is a "star finder" app for a smart phone. I have one called Sky Guide on my iPhone and it makes life much easier. When held to the sky, it shows a map of the celestial objects in view with prominent ones labeled. By holding that over the top of my camera like a gun sight, I can place Polaris in my camera's field of view with fairly good confidence. It's also important to carefully assess the terrestrial objects and place them in the bottom of the field of view, unless you wish to have a shot that only shows stars. In this case, I liked the way that a large white pine provided a border on the left, and the manner in which the deciduous trees sloped to the right. I did try and pinhole Polaris in that little gap between the pine and other trees, and nearly nailed that. To better assess the location of terrestrial objects and place them appropriately in the image, a flashlight can be used to illuminate things making them easier to find in the camera's view finder. Once all of this has been done (and you've checked to see that the battery is charged and space is on the memory card) all that remains is to activate the camera shutter. And wait an hour or so, fingers crossed and hoping everything was well set up. If so, the end result can be extraordinary. I look forward to shooting astrophotography in a truly dark environment someday. 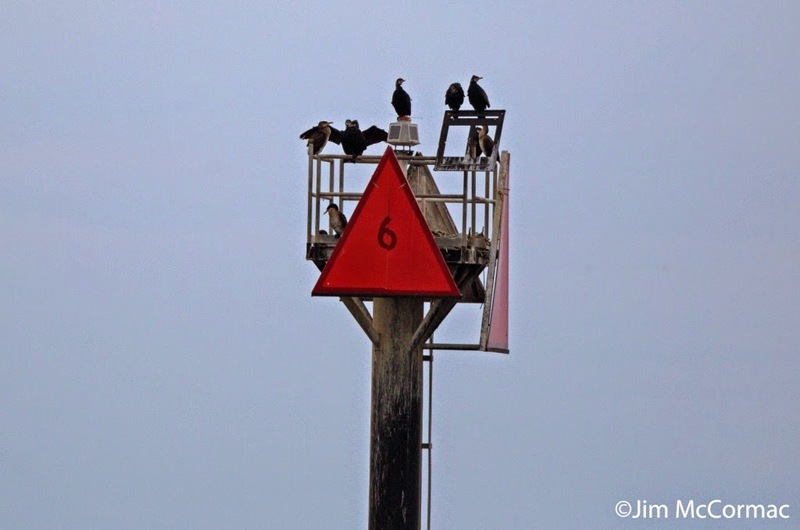 The ominous - to a fish, anyway - black silhouettes of Great Cormorants, Phalacrocorax carbo, adorn a marker at the entrance to Barnegat Bay in New Jersey. 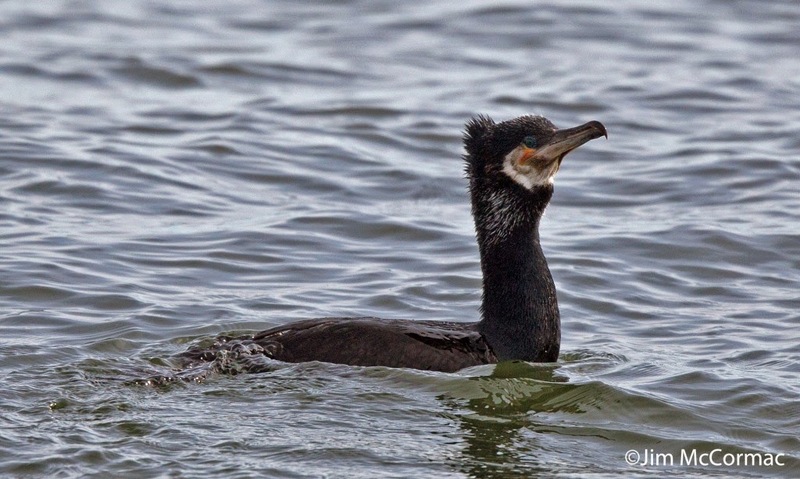 This large species of cormorant has the widest distribution of any cormorant species, occurring in Australia, Africa, Asia, and Europe. 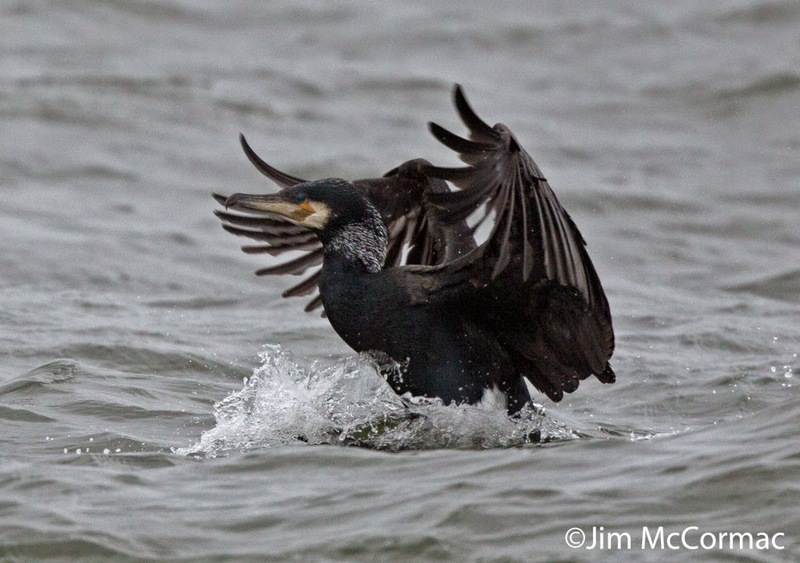 In North America, Great Cormorants breed only in maritime zones of the North Atlantic, from Greenland south to Maine. 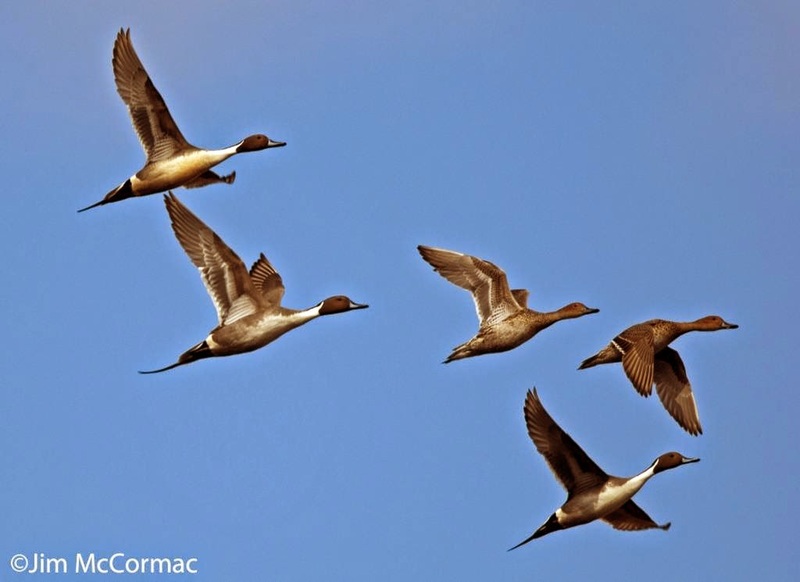 Wintering birds move south into the mid-Atlantic region. For interior-dwelling landlubbers used to seeing Double-crested Cormorants, P. auritus, the comparatively massive Great Cormorants are a shock. 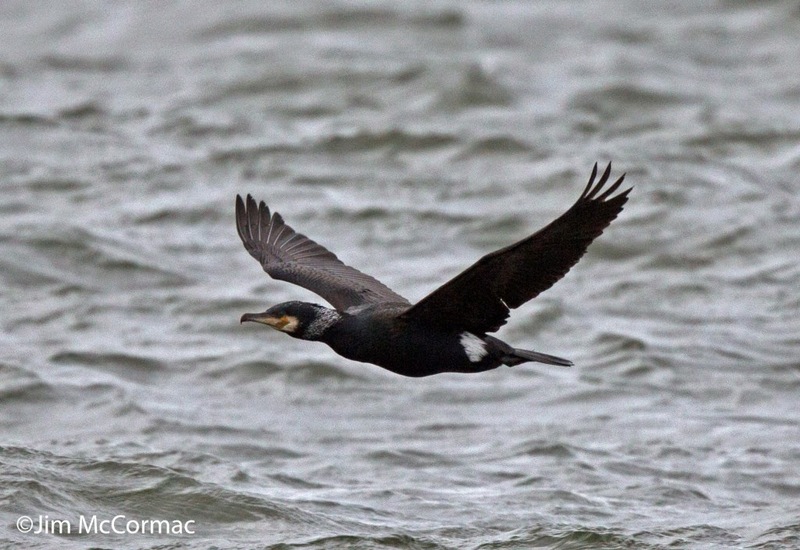 The wingspan is nearly a foot longer, and a Great Cormorant is almost twice the weight of a Double-crested, making for a much bulkier looking bird. The bird in this photo is an adult coming into breeding plumage, and it sports a distinctive white flank patch, a white throat, and whitish feathering is developing on the neck. Great Cormorants feed almost entirely on fish, and as we shall see, you would not want to be one of those anywhere near this cormorant that has splashed in for a bout of fishing. 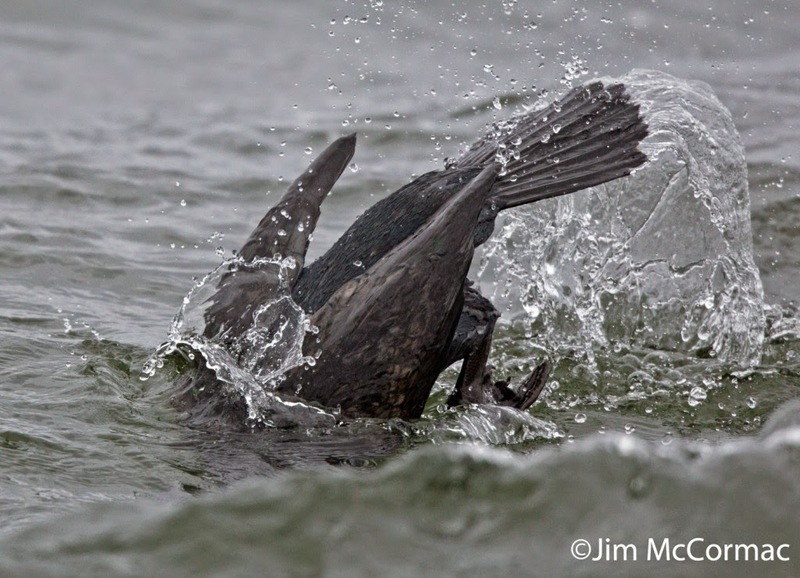 Cormorants are great divers, and once under the water visually locate and pursue their scaly prey. Some of their victims can be massive as we shall see. Ah! This should be good! The hard-working bird finally muscled up what appeared to be a small log - a big fish of some sort. 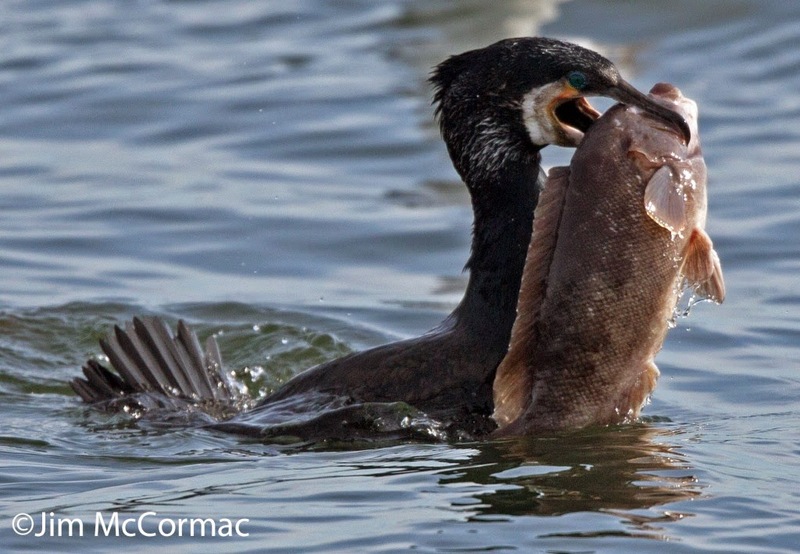 The cormorant finally managed to wrestle the fish well out of the water, enabling this documentary photo. The fish appears to be a cunner, Tautoglabrus adpressus, which is a bottom-dwelling species. Thanks to Mark Dilley for pointing me in the right direction regarding the victim's identification. Cunners apparently enter a torpor-like state in winter, so once the cormorant located it, the fish was probably easy pickings. Obviously, though, the real challenge now comes in actually swallowing this thing. 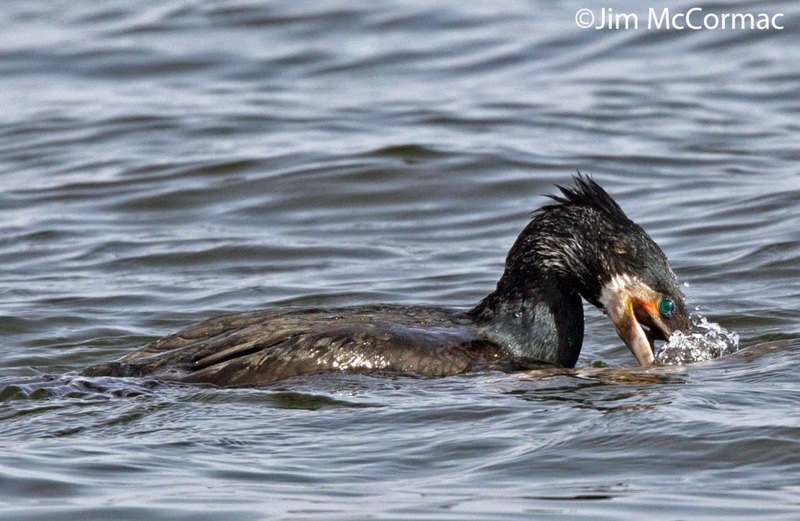 Looking at the fish to bird ratio, I would scarcely believe it possible that the cormorant could choke that thing down. 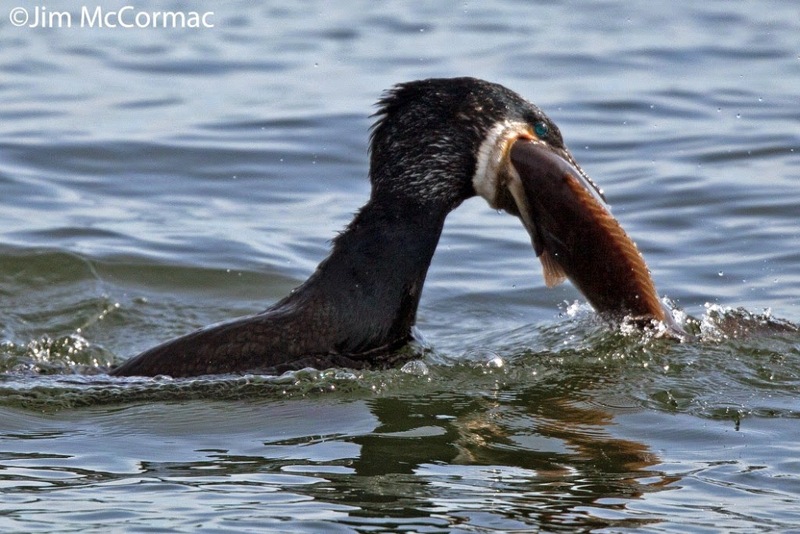 But the cormorant did indeed choke it down - in fact, it nearly inhaled the fish. I only got this one shot off before the fish was gone, sucked right down the bird's throat. Resting fat and happy, stubby little crest erect and throat engorged. I would think a meal like that would last the bird for some time. This experience calls to mind that stupidly inaccurate expression "eats like a bird", which is used to refer to a person that eats very little food. Believe me, you don't want to truly "eat like a bird" or you'll be paying Weight Watchers overtime. The maximum weight of a cunner is 2.2 lbs., and I'd say that the one eaten by our cormorant weighed a pound, probably - maybe more, possibly a bit less. 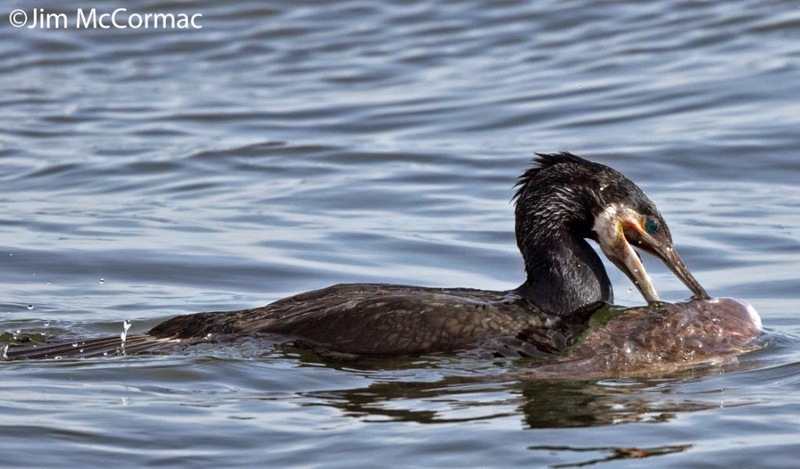 As a Great Cormorant weighs about seven pounds, this bird just ingested one-seventh of its bodyweight in a few seconds. For a 200 lb. man to match this feat, he would have to consume about 29 lbs. of food at once. Even Joey Chestnut could not come close to that. My advice? Don't eat like a bird. 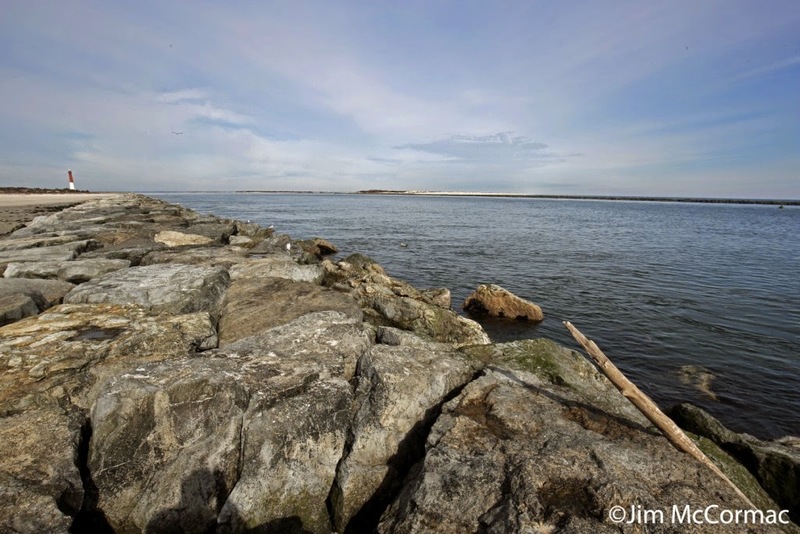 The long stone breakwall at Barnegat Light, New Jersey is a famous birding spot. When I find myself in that part of the world, a visit is irresistible. Such was the case last weekend, when a trip to nearby eastern Pennsylvania provided the chance for a whirlwind Barnegat trip. In little more than a day, I clicked off several thousand images, and got some really cool stuff. Barnegat Light's namesake lighthouse is WAY down there at the end of the breakwall. The parking lot is by the lighthouse, so it's a bit of a haul to get down to where I made this photo, but the birds get better the further towards the sea one gets. Barnegat Bay is on the right, and the Atlantic Ocean is behind us. 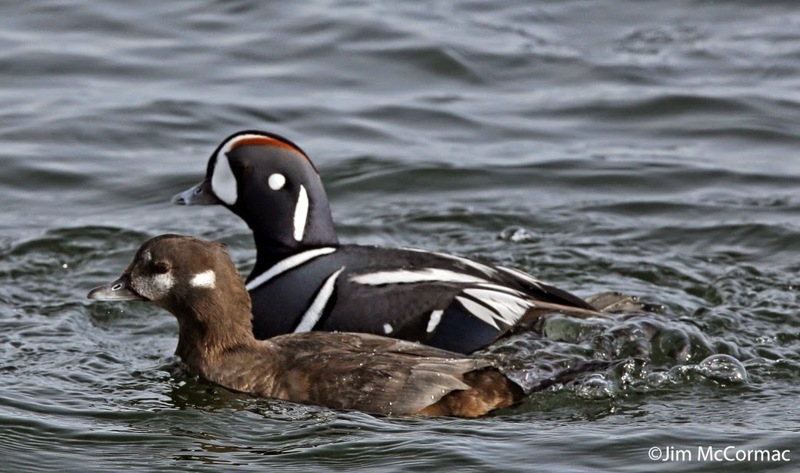 By far the most popular avian lure that draws people to Barnegat Light during the colder months are the Harlequin Ducks. A few dozen overwinter here, and they typically can be found resting and foraging along the rocks, often nearly at one's feet. Who would not want to see such an animal? 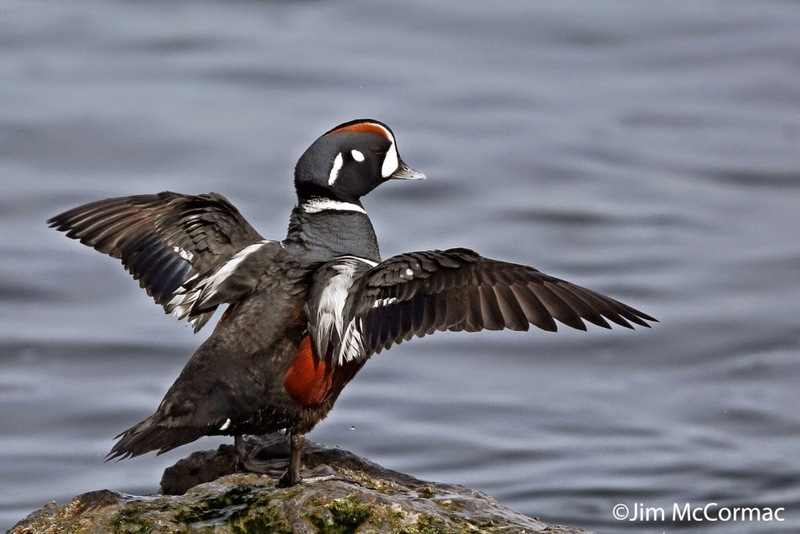 Male Harlequin Ducks are spectacularly gaudy; a Picasso come to life. 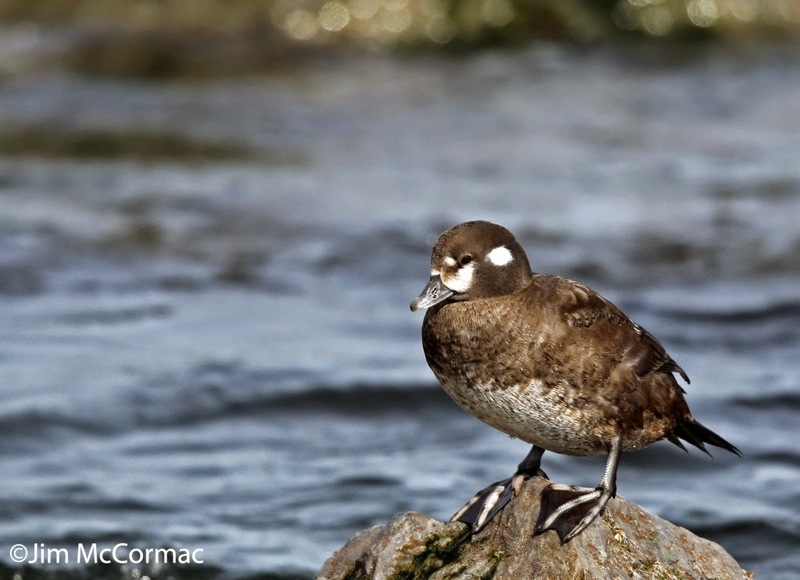 This bird has probably been photographed a thousand times; Barnegat's Harlequins may be the most photographed and visited Harlequin Ducks anywhere. There can be no denying that the females are much duller than the males, but nonetheless they have their charms. And big feet, to boot. While photographing birds and watching the sea, I suddenly heard a particularly frenetic volley of comical squeaks from one of the ducks. Whirling around, I saw a male becoming especially amorous towards a certain young lady. Suspecting what might be in store, I spun the camera rig around and got ready. Sure enough, the male jumped atop the female, and quick as a wink I might add. He was a bit rough about it too, if you ask me. As I said, a bit rough. Note how our dotted and dashed Casanova has grabbed her by the feathers on her head, and is tugging away. Maybe she likes that, I don't know. 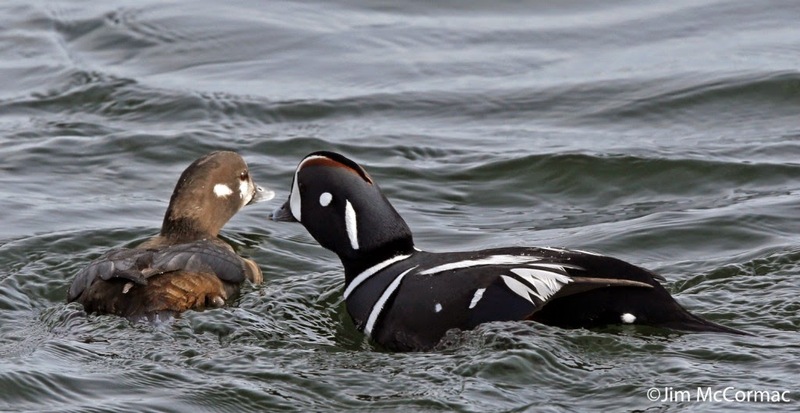 Anyway, it is of great importance to the world that young Harlequin Ducks regularly be made to replenish the stock, and this is how the birds go about it. After copulation was complete, the birds rather quickly parted company. He, perhaps, to gloat to his buddies, she possibly to rub her sore head. 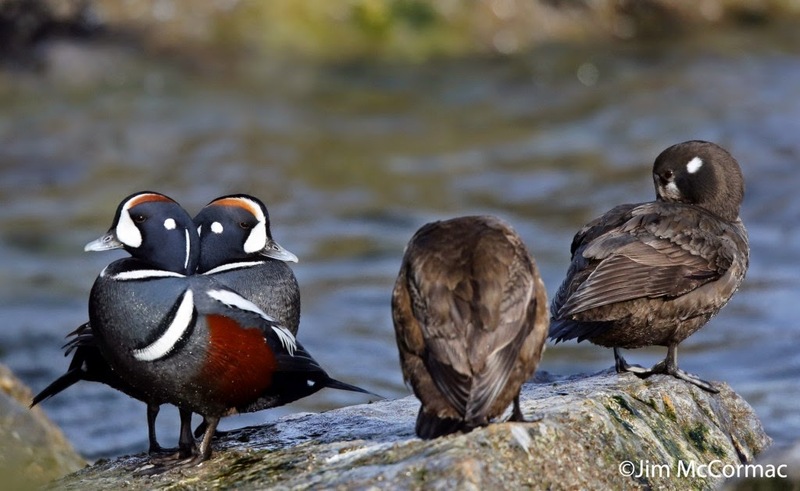 Many birders keep a "copulation list" of birds caught in the act of procreating. I don't, but if I did, this would be a really good checkmark on that list. Registration for Mothapalooza is open! It actually opened almost two weeks ago, but I'm only now getting around to plugging it. Of the 140 available slots, there are only 30 left, so you'll want to get in on this REAL DARN FAST! In the photo above, attendees at Mothapalooza I (the coming one is Mothapalooza III) gather around a lit sheet, admiring myriad mysterious denizens of the nighttime forest who have fluttered into the flame. This year's Mothapalooza returns to the moth-filled haunts of Shawnee State Forest, and the Edge of Appalachia Preserve in southernmost Ohio. The region is a treasure trove of biodiversity, and in addition to a jaw-dropping number of moth species, we'll see scores of interesting plants, butterflies, birds, mammals and more. The dates are June 12 - 14, and every detail can be found at the comprehensive Mothapalooza website, RIGHT HERE. Who would not want to see a creature such as this peeking over a nearby leaf? Any photographer in their right mind would. It's a Black-waved Flannel Moth, just one of scores of showy moths that will be on tap. Moths are a photographer's dream, whether you're armed with a point & shoot, or sophisticated DSLR gear. This Sassafras Caloptilia Moth strikes an odd pose, except it's not an odd pose for the moth - that's how they always sit. If you want to try a really different sort of immersion into the natural world, try Mothapalooza. We have the greatest time, learn tons of stuff, see things no one thought possible, and venture into the depths of darkened forests. To register, GO HERE. "Oh my, what big feet you have, Mr. Coot!" 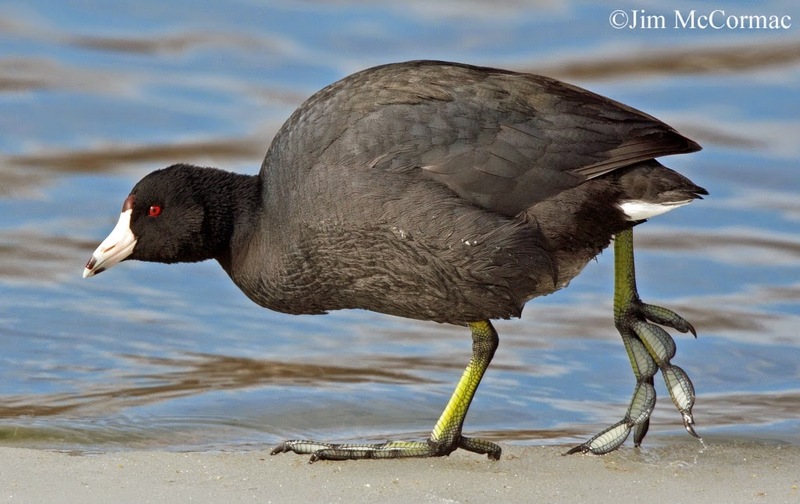 There are a lot of distinctive features to a coot, not the least of which are its feet. They are huge multi-lobed affairs, all the better for traversing spongy wetland plants and various floating debris. This American Coot was one of many consorting with hundreds of waterfowl of many species in an open lead in otherwise frozen Alum Creek Reservoir. I like coots - always have - and seized the opportunity to fire off some shots when this one ambled by, showing off its funny feet. While the coot is a member of the rail family (Rallidae), it is certainly an odd duck amongst that crew. The other species, at least in our range, are highly secretive marsh dwellers such as the Sora, and Virginia Rail. Two of the biggest skulkers and hardest to see birds in North America are in this family, the Black and Yellow rails. I guess the extroverted coots make up for their brethren's shyness, and come out to let us appreciate the charms of the family. Come nesting season, though, coots become a bit harder to see, as they occupy dense marshlands. They're easy to hear though; a "singing" coot makes loud keening cries that carry for some distance. Precious little time of late to cart the camera out and snap off photos. But a window opened up this afternoon, and I spent a few hours clicking the shutter about 1,500 times at one of my favorite subjects, waterfowl. There is an easily accessible open lead in otherwise frozen Alum Creek Reservoir, Delaware County, Ohio. It's just north of the Cheshire Road bridge, on the east side of the lake. The hole is jammed with waterfowl of many species, and if time permits I'll post some really cool stuff from this foray. But for now, a female and male Red-breasted Merganser, two of many that were present. 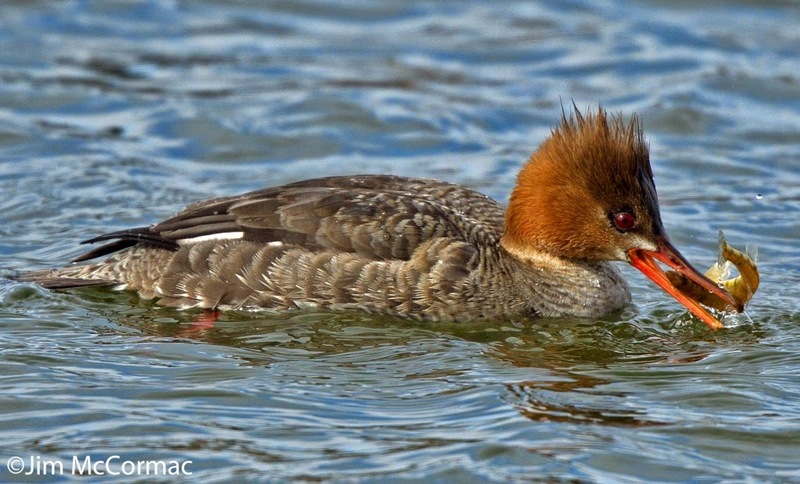 A hen Red-breasted Merganser wrestles a small yellow perch into position for swallowing. 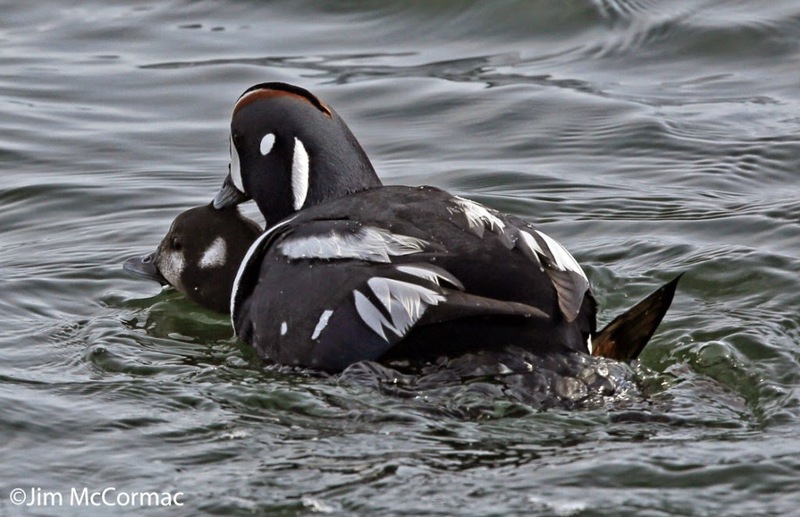 A colloquial name for this duck is "sawbill", and that's because its mandibles are edged with sharp serrations, the better to grasp slippery prey. Nearby was this gaudy drake. 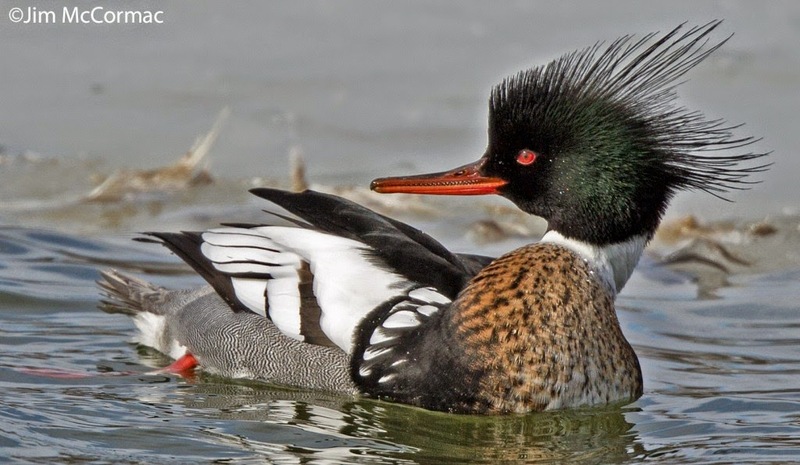 The boy mergansers were keenly interested in the girls, and many were engaged in their comical bowing courtship displays. I caught some of that action on pixels, and will try to put up some photos later. Anyway, what a cool duck this is! Tis the season for event promotion. And here's another one well worth a plug, and well worth attending. The Ohio Botanical Symposium, which like some primroses is now a biennial event, takes the stage on Friday, March 27 at the beautiful Villa Milano Conference Center in Columbus. CLICK HERE for details, and registration. If memory serves, the botanical symposium was started over 20 years ago by the Ohio Division of Natural Areas and Preserves. We had about 40 people at the inaugural event. Attendance grew by leaps and bounds, requiring regular shifts to larger venues. The Villa Milano can handle about 400 people, and the remaining spaces for this year's conference are rapidly dwindling. Register soon. It usually fills up. The keynote is Dr. Robbin Moran of the New York Botanical Garden. 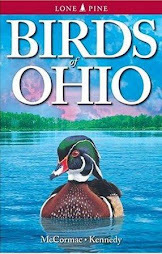 He authored the book A Natural History of Ferns, and will discuss the interesting hidden lives of Ohio's most interesting ferns. Another easterner, Dr. Cynthia Morton of the Carnegie Museum of Natural History in Pittsburgh, will discuss urban forests and their importance. 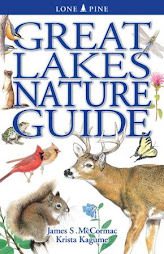 Bob Glotzhober, emeritus natural history curator of the Ohio Historical Society, will talk about the amazing botanical diversity of one of Ohio's most iconic natural areas, Cedar Bog. The "Garden Sage" herself, Debra Knapke, will wax eloquent about the state's edible plants, including ones that you can grow. Phlox is always a crowd-pleaser, and among their ranks are some of our greatest botanical eye candy. Peter Zale will give the lowdown on this colorful group. 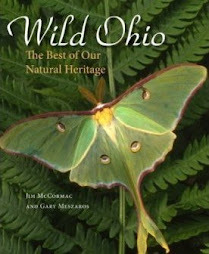 The synopsis of "Ohio's Best Botanical Finds" is always a crowd-pleaser at the botanical symposium. Andrew Gibson will detail the very best of new native plant discoveries of the last two years, which include rediscoveries of plants thought gone from the state, and plants never before found within Ohio's borders. Your narrator is a last minute pinch-hitter, filling in for a speaker whose extenuating circumstances preclude involvement with this year's symposium. Fortunately, the subject is one that I have a passing knowledge of: goldenrods. This group is among the most beautiful and important of Midwestern plants, and I'll attempt to sell their virtues. Ohio Goldenrod, Oligoneuron (Solidago) ohioense, one of two species of goldenrods originally discovered in the Buckeye State. Woven into the fibers of our goldenrods is some fascinating human history, and I hope to touch on some of that. 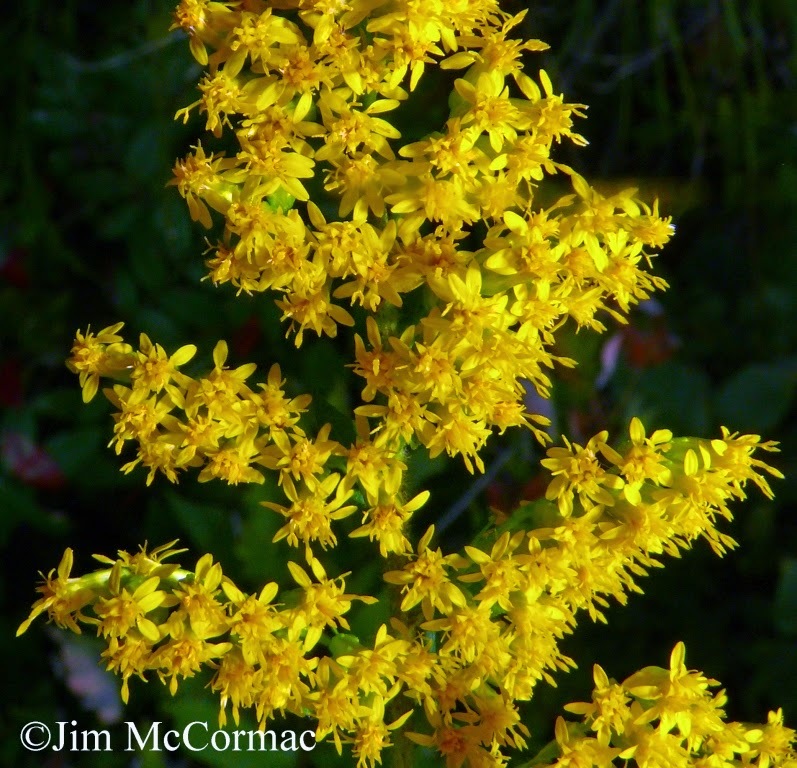 The striking lemony flowers of Wrinkled-leaf Goldenrod, Solidago rugosa, form a showy pyramidal inflorescence. Collectively, goldenrods can form a dominant part of the vegetative biomass in certain habitats, and their abundant nectar and pollen serve an abundance of insect life. Wherever nectar-seeking bugs gather, you can be sure that predators will be waiting. 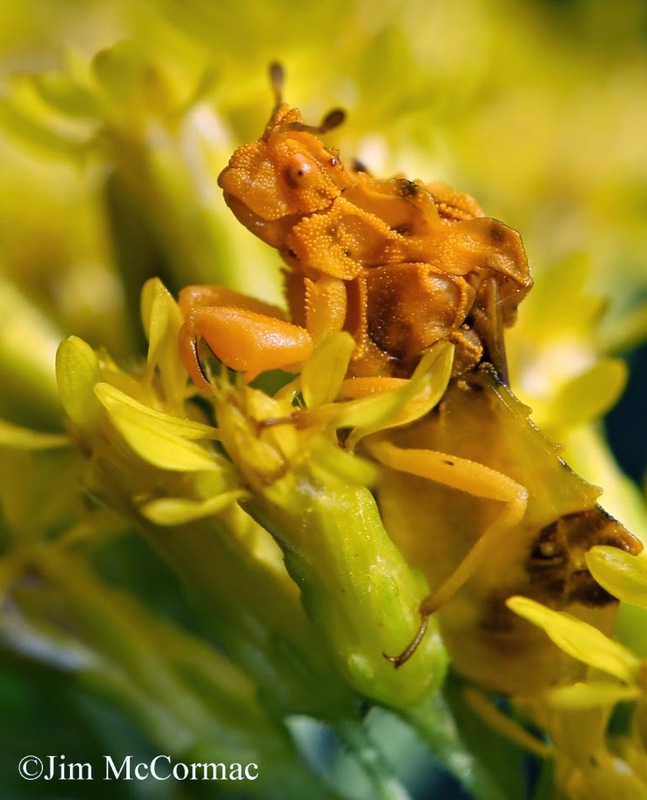 In the case of goldenrods, several species of insects (and spiders), such as this Goldenrod Ambush Bug, have coevolved with goldenrod and match their substrate to a remarkable degree. Other insects use goldenrod tissue for food, and nurseries. Perhaps you've seen these swollen protrusions on the stems of Tall Goldenrod, Solidago altissima. They're the work of the tiny Goldenrod Gall Fly. The fly's grub is seemingly safely ensconced within the hard growth of plant tissue. But alas - no one is safe! 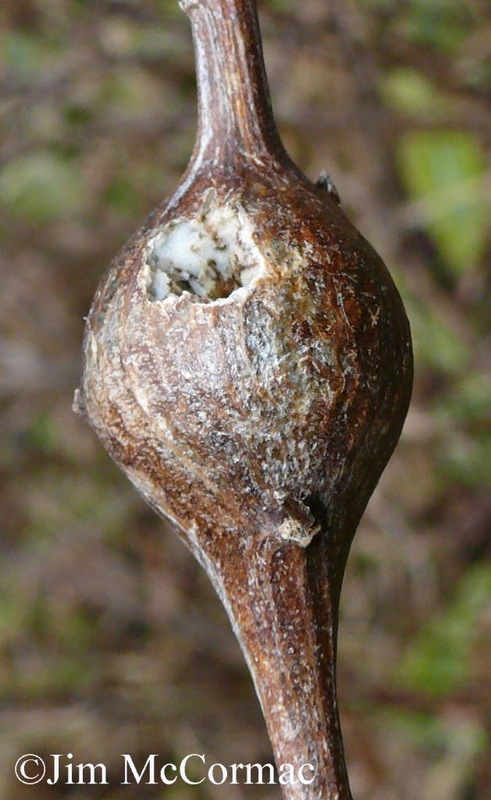 A Downy Woodpecker has drilled into the gall and excavated the tasty grub. 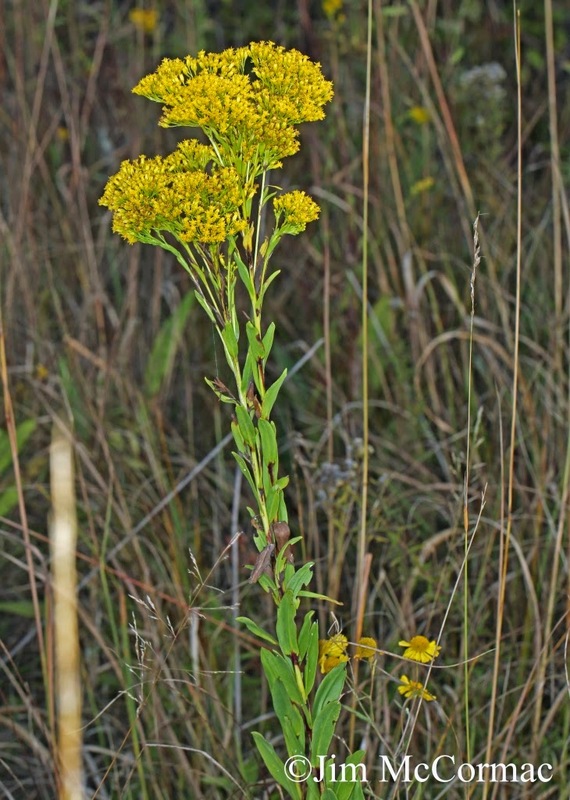 Just one of many ecological chains formed by goldenrods. Again, complete conference info is RIGHT HERE. Wildlife Diversity Conference - last call! Wednesday, March 11 is the date of the annual Ohio Wildlife Diversity Conference and you won't want to miss it. The conference is held at the Aladdin Shriner's Complex at 3850 Stelzer Road in Columbus. All of the details are RIGHT HERE. 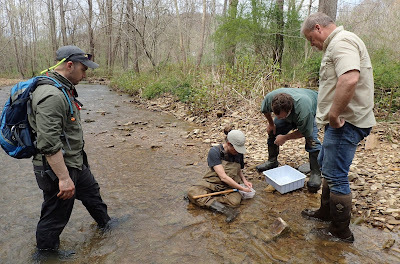 It is customary for the conference's organizer, the Ohio Division of Wildlife, to unveil something new and interesting at the event, and this year is no exception. Voila! That's right - a publication on lichens! Wait'll you see this thing. 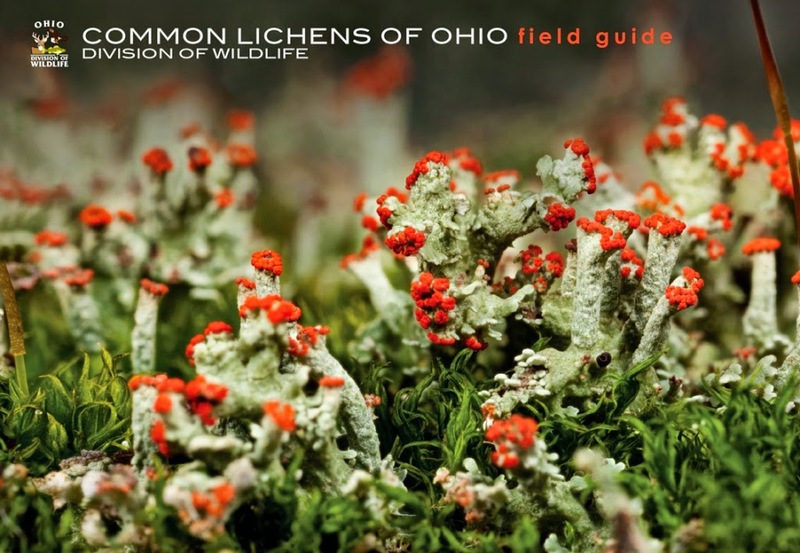 Authored by lichenologist Ray Showman, with photographic contributions from Bob Klips, it reveals the beauty and importance of these interesting fungus/algae combo organisms. The guide is free, and all conference attendees get one. 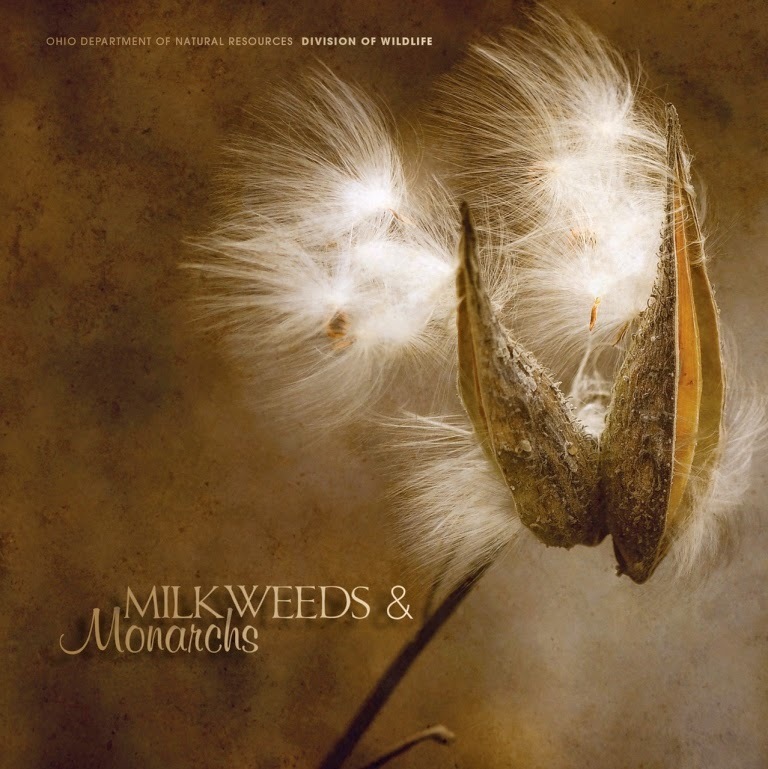 Also to be debuted - again, free - is this artfully designed booklet that tells you the ins and outs of milkweeds, and how they relate to monarch butterflies. And much more, such as info on many other milkweed obligate insects, which milkweeds are indigenous to Ohio, and which of them might work best for the yardscape. Walk-ins are more than welcome at the conference, but pre-registering is best. To register, just CLICK HERE. 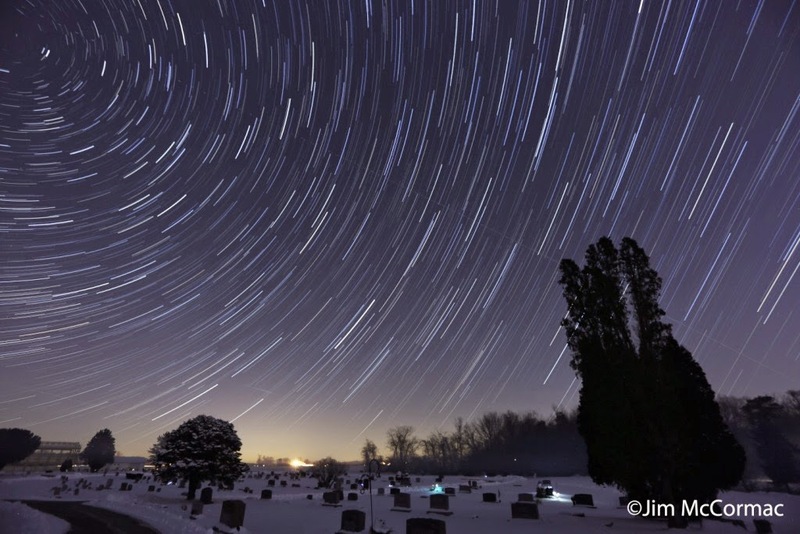 In my last post, HERE, I wrote about the making of star trail photos on a rather frosty winter evening. I thought one of the resultant photos, above, was pretty cool. Not bad for a first time effort. Well, I hadn't seen nothin' yet! I made two hour long exposures, one of which is the photo above. The other one wasn't nearly as good. It was my first effort, and I had allowed too much light to collect via too large of an ISO setting. For the next long-exposure image, I dialed things down and achieved the above result, which was an improvement. But my research had indicated that making a long series of 30 second exposures would generally yield much better results. The only hitch is that one must digitally stitch the images together, in the order in which they were taken. So, I did indeed take a long series of short exposures, thinking that eventually I'd learn how to sew them all together. Which I did. An ENORMOUS improvement on the long single exposure shots! 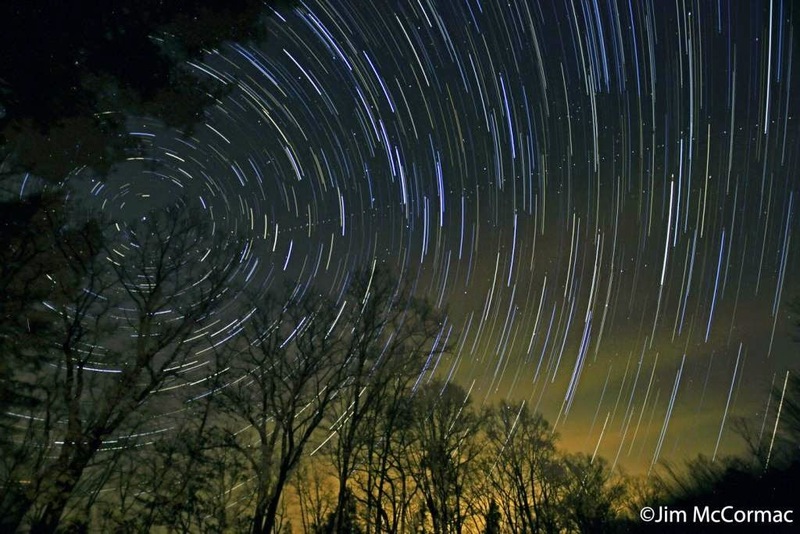 And stitching them together is as easy as pie, thanks to the www.startrails.de website! A German by the name of Achim Schaller (who must be a genius) created software that allows multiple exposures of astrophotography shots to be seamlessly melded together, allowing results such as the above image. Thanks to Toni Hartley for showing me how to work the software, too. There is no question that the second image is far beyond the single shot exposure, for which I kept the camera's shutter open for a whopping 56 minutes. The second shot was achieved by stitching together a total of 84 images. Each exposure was 30 seconds long, and the camera was set to f/4 (wide open on my 17-40mm Canon lens), at a focal length of 17mm and ISO at 500. As mentioned in the previous post, I set the white balance to tungsten, which gives the night sky a steely blue cast. Photogs shooting in RAW could convert to that white balance mode later, in post-processing, but why not get it right of the can. Of course, to shoot uninterrupted 30 second exposures over the better part of an hour, one must use a remote shutter release that will lock in place, thus constantly tripping the shutter until told to quit. The reason that the second image is superior is in large part due to the much shorter exposures. There was more ambient light where I made this image than is desirable, from nearby houses, farms, and a few distant cities. Thus, the super long exposure shots harvested tons of light, largely blowing out the stars. The short exposures did not keep the shutter open long enough to collect much light other than that of the targeted stars, thus the much showier photo. After shutting down the camera, all that remains is to stitch all of the images together, and as reported earlier that is pretty simple with good software. I eagerly await the return of the new moon, hopefully with attendant clear skies. Then, a trip to a truly dark corner of earth will be in order.